The most astute assessment of the genre remains Bagehot’s (no surprise) review-essay of 1855, in which he explained the form’s development and appeal as consequences of the quickening pace of modern life: “There is, as yet, no Act of Parliament compelling a bona fide traveler to read. If you wish him to read you must make reading pleasant.” Readers hungered to be exposed to what George Eliot, herself a prodigious reviewer, called “the lively currents of thought and discussion” scrutinized by the Reviews but would not, as Bagehot recognized, “indulgently and pleasantly peruse” the kind of solid, expansive scholarship characteristic of the past; they wanted their literature and scholarship “portable” (“as they take sandwiches on a journey,” Bagehot wrote). Which meant, he concluded, that “in this transition from ancient writing to modern, the review-like essay and the essay-like review fill a large space.” The essay-like review was unashamedly a form of haute vulgarization, but its practitioners refused to allow this to mean any diminution in intellectual vitality. Combining cleverness, grace, and apparent omniscience, the review-essay was irresistible. When he looked back half a century to the launch of the Edinburgh Review, in 1802, Lord Cockburn, Jeffrey’s biographer, wrote, “The effect was electrical. It is impossible, for those who did not live at the time … to feel or almost to understand, the impression made by the new luminary.” This impression extended across Europe. Napoleon and Stendhal were devoted readers, and Madame de Staël declared the publication “the highest pitch of human intellect.” TheEdinburgh Review soon spawned a host of other Reviews—so many that Carlyle marveled in 1830, “Reviewing spreads with strange vigor … By and by it will be found that all Literature has become one boundless, self-devouring Review.” Macaulay’s essay-like reviews in the Edinburgh Review—written with unrivaled élan on topics ranging from Milton to Machiavelli and from “The Civil Disabilities of the Jews” to the origins of the Raj—were reprinted (in pirated and in authorized editions) as a collection of “essays” (as were the “essays” of most of the other great reviewers); that book became one of the great transatlantic best sellers of the nineteenth century. Because the review-essay came to be regarded as the most convenient and stylish device for shaping the contemporary intellectual scene, the subjects the Reviews embraced were astonishingly broad. Even at the end of the nineteenth century the “criticism” in the Reviews treated philosophy, science, theology, and economics as well as fiction and poetry; and as late as the 1920s T. S. Eliot averred, in his essay “The Idea of a Literary Review,” that the question of such a publication’s scope turned on “the precise application of the term ‘literature,'” explaining, “We must include besides ‘creative’ work and literary criticism, any material which should be operative on general ideas—the results of contemporary work in history, archaeology, anthropology, even of the more technical sciences when those results are of such a nature to be valuable to the man of general culture and when they can be made intelligible to him.” More surprising, the subjects individual critics addressed were equally broad. Just as the Reviews assumed that their readers would be interested in and able to appreciate a wide range of knowledge, so the reviewers assumed that specialized learning was a less important attribute for communicating with those readers than an astute mind and a facile pen. “There is something to be said,” Morely wrote, “for the writer by profession, who without being an expert, will take trouble to work up his subject, to learn what is said and thought about it, to penetrate to the real points, to get the same mastery over it as an advocate or a judge does over a patent case or a suit about rubrics and vestments.” In this way the reviewers, although professional writers, were amateurs, as Macdonald was to observe of their twentieth-century counterparts. he year after the death of Queen Victoria, The Times of London introduced a literary supplement intended, as the newspaper’s editor declared, to occupy “the same position of authority in its narrower sphere as that of The Times in its wider sphere.” Its animating spirit, as May nicely puts it, “was that literature was for keen general readers, not for specialists,” and that therefore the new paper’s “role would above all else be like that of an educated reader, helping other such readers to find the books that were most worth reading.” Bruce Richmond, a Times editor and a man T. S. Eliot remembered for his “bird-like alertness of eye, body and mind,” would effectively be the first editor of the Lit Supp (as it was known familiarly until the 1960s), and would remain at its helm until 1937. He saw to it that the publication carried out its role as the definitive guide for the general reader—and often with a panache surprising for the literary organ of the British establishment’s rather gray paper of record. 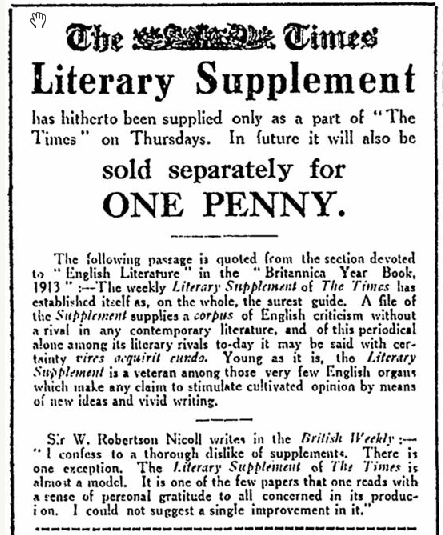 Richmond delivered a similar evaluation, albeit free of vituperation, when, looking back at his tenure at the Times Literary Supplement, he noted that the paper itself had changed around 1926. May writes that although in fact “nothing changed dramatically that year,” Richmond “was thinking mainly of its metamorphosis from a general paper to a rather more academic one,” and then notes that by the late 1920s “the earlier brilliant lights”—such as Woolf, Eliot, Percy Lubbock, and John Middleton Murry—”were not contributing so frequently.” In 1938 the TLS‘s regular fiction reviewer, Orlo Williams, wrote a series of three articles on literary and intellectual journalism and concluded that Britain was “once the home, now the grave, of the great [Review].” This prompted a letter to the TLS from Murry, who, anticipating Woolf’s lament the following year, in her essay “Reviewing,” declared that “book reviewing is a vanished profession.” Murry commented that writers who loved reading now often became academics, but that “a kind of paralysis appears to descend on the man of letters” upon entering academe. Indeed, the rise of the academic professionals—and their increasing and pernicious dominance of intellectual life—forms the subplot of Critical Times: repeatedly throughout his meticulous (usually month by month!) 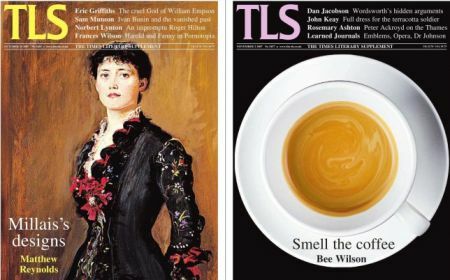 survey May observes that the TLS was in this period or that becoming more of an academic journal, as its readership, in a paraphrase of Woolf’s formulation, became more and more composed of those who loved learning rather than those who loved reading. It’s a dispiriting story. 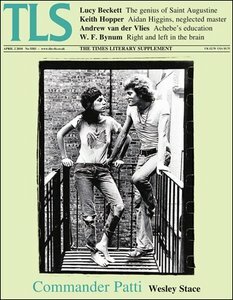 Geoffrey Grigson’s 1975 complaint in the TLS echoed Williams’s, but by then the situation had grown much worse. Grigson noted that at least sixteen academics had written reviews for the April 25 issue alone. (He singled out one professor’s piece to show that “nearly every sentence in his five columns is blown up with stifling clichés … culminating in arcane announcements fit for an academic’s Pseuds’ Corner.”) By the 1980s, May notes without comment, “The subediting and rewriting … was extensive now, with more academics—who were not necessarily good writers—contributing.” And things only continued to slide. By far the most depressing pages of May’s chronicle are devoted to the turgid 1994 debate in the TLS over the merits of what its practitioners have dubbed “critical theory.” I defy anyone who has not attended a graduate seminar in literature in the past twenty years to explain one contributor’s assertion that the “developments of feminist critical theory, gender theory, and its offshoots in gay studies and queer theory, have revitalized literary study.” The TLS‘s earlier pieces on fiction, poetry, and literary criticism—specifically Eliot’s and Woolf’s essays—are by far its most impressive achievements; but some of its more recent ones, bloated and nearly incomprehensible, undoubtedly represent the paper’s nadir. 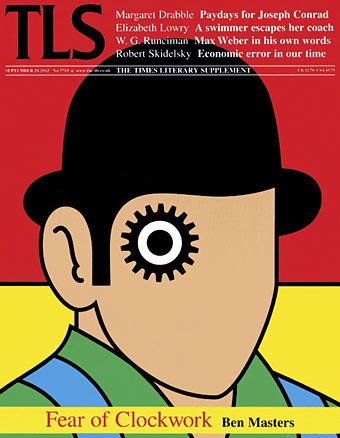 o be fair, though, the TLS‘s evolution away from the standards of a general cultural paper has been quite moderate. May’s term “academic journal” implies something the TLS is not. True, since the closing decade of Richmond’s editorship academics have made up more and more of its readership, and it has devoted itself more and more to somewhat specialized academic debates and findings. But it has usually treated them in a fairly nonspecialized manner: footnotes, jargon, and other scholarly apparatus rarely appear. Whether many of those debates and findings have justified the attention the paper has given to them is another matter; nevertheless, its academic reviewers, especially in history, have included some of the most daring minds and sparkling stylists the English-speaking world’s professoriat has had to offer. Moreover, the tradition of the accessible, informal, and fluent review-essay is so ingrained in Britain’s educated classes that the difference, which Macdonald found striking, between Britain’s intellectual journalism and most of America’s will long remain conspicuous. Furthermore, a great deal of the TLS‘s academicism, as May’s account shows, has tended toward a quaint bookishness, rather than toward the obfuscatory intellectual prose style that Macdonald abhorred in American academe. 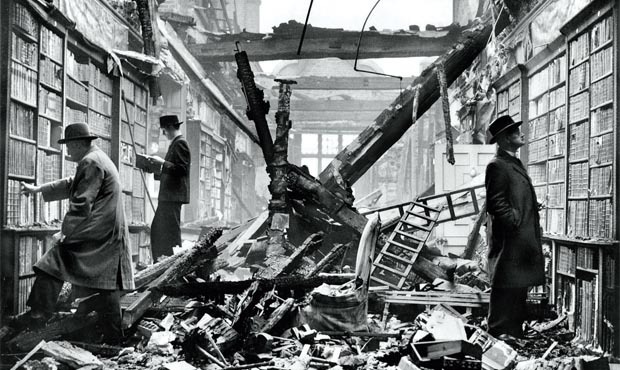 (In May of 1942, for instance, just after the German air raids on Exeter, Bath, and Norwich, in which 1,000 civilians were killed, TLS readers were treated to a piece titled “Minor Verse of the Regency Period.”) Most important, the TLS experienced a renaissance of sorts from 1948 to 1958, the period in which Macdonald examined it, under the editorship of the cosmopolitan and most un-academic Alan Pryce-Jones, who covered and promoted European writers and philosophers and who hired Anthony Powell, the most accomplished regular fiction reviewer and fiction-reviews editor in the journal’s history. 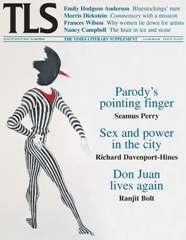 (Powell dryly noted of the period after Pryce-Jones became editor, “TLS reviewers seemed to become a shade less stodgy overnight, a faint but perceptible odour of chic sometimes drifting through the caverns of Printing House Square.”) And, of course, the TLS has always run significant, sometimes extraordinary, individual articles. Philip Larkin’s two 1977 tributes to Barbara Pym alone more than justify its existence; Larkin’s encomiums single-handedly won Pym the recognition that had so long and unjustly eluded her. Bagehot attributed the flowering of the “essay-like review” in the Edinburgh Review partly to the system of learning in Scottish universities, which, in contrast to the pedantic, specialized scholarship prevailing in England in the early nineteenth century, encouraged its students to argue animatedly about literature, history, philosophy, and political economy, making “a man fancy he knows everything.” That system, he asserted, tended “to cultivate habits of independent thought and original discussion,” and thus “seems to have been designed to teach men to write essays and articles.” The reader examining the great reviewers’ essays is struck repeatedly by their sense of liberation from scholasticism, from what Bagehot called the “tedious … painful words of an elaborate sage.” As Hazlitt exulted, “Knowledge is no longer confined to the few: the object therefore is, to make it accessible and attractive to the many … the cells of learning are thrown open … Therefore, let Reviews flourish.” And flourish they did. 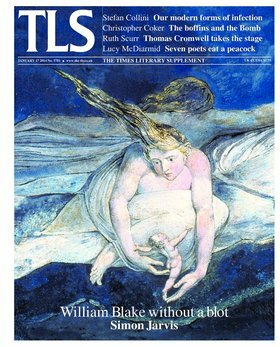 The legacy of the great Reviews, which includes the TLS, was attenuated but intact enough in mid-twentieth-century Britain to beguile one of America’s great public intellectuals. That legacy survives, but as May’s history attests, the very academicism from which it once liberated writers and readers now threatens to strangle it.